If you've ever dreamt of taking to the road for a year in an RV, Doreen Orion's funny travelogue, Queen of the Road, is a must read. Subtitled "The True Tale of 47 States, 22,000 Miles, 200 Shoes, 2 Cats, 1 Poodle, a Husband, and a Bus with a Will of Its Own", the story will either make you reconsider or itch to hit the road. Doreen and her husband are both psychiatrists. She was perfectly happy handling her job for insurance companies from her bed, working in her pajamas and seldom leaving the house. But, her husband, Tim, had a dream of converting a bus and traveling the United States for a year. In a weak moment, Doreen agreed. She never thought of the small amount of clothes and shoes she could take, the life her pets would have on the road, or, worst of all, actually having to ride and live on the bus. Queen of the Road is a delightful story of two people who learned how much they enjoyed each other as they spent 24/7 together. I've been in most of the fifty states, so I appreciated the descriptions of the spots they visited on their trips, tourist traps and all. As an extra bonus, Orion includes recipes for the various drinks she had along the way, the alcoholic beverages that kept her sane despite her fear of the bus. Queen of the Road is a book to pick up before you make that final decision to take to the road. 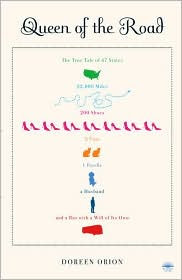 Queen of the Road: The True Tale of 47 States, 22,000 Miles, 200 Shoes, 2 Cats, 1 Poodle, a Husband, and a Bus with a Will of Its Own by Doreen Orion. Bantam Books, ©2008. ISBN 9780767928533 (paperback), 272p. My Google alert led me to your lovely review of my book. Thank you! QUEEN OF THE ROAD is already in 6th printing due to reader word-of-mouth and blogger word-of... well, blog. I really do appreciate it! Also wanted to mention that I've been visiting book clubs via speakerphone all over the U.S and Canada since QUEEN OF THE ROAD came out and it's been tons of fun (at least for me). So, if any of your readers are interested, they can contact me via my website. Very best and Queen On! If you come back, I just wanted to say personally that I appreciated so many of your comments since I've been in 46 of the 50 states, thanks to parents who took us in a converted van. Saw Mt. Rushmore, the Corn Palace, so many of the sites. And, I'm from northern Ohio, the town just east of Cedar Point. When you mentioned roller coasters, I knew it was home! And, when we lived in Florida, we lived in Estero, down the road from Koreshan. It is a little odd, isn't it? Thanks for a fun book!